More music and information about the artists above can be found via the latest in area of Jjays Free Promotion or the artist area. Just click on your favourite artist! The services which this excellent studio provide include professional mix mastering, artist mentoring/management, superb promotional videos and a whole host of superb value for money production services. If these services interest you you can easily reach Venombase studios by clicking on their logo above. It has been decided to make this promotion interesting by spicing up things with a competition lasting until May 29th 2017. A randomly selected right answer will result in a a prize worth £10 ($16, €12) . For pay as you go mobile phone users this will be a top-up voucher for the winners preferred network. They need only provide an email address which could be anonomous webmail for a scan of the voucher to be sent. This means no unnecessary disclosure of postal address is required. Mobile phone contract users if they would like to suggest another type of voucher or bitcoin for the same value and a method of delivery then JJays will use its discretion. List of original composers in video, in random order with one classical master and two modern composers kept a mystery. Note each composer could have more than 1 composition included in the video, but to make things a little easier all new composers will have their music on this web site somewhere. Also YouTube may not necessarily list the original composer required for this competition, on its copyright messages. 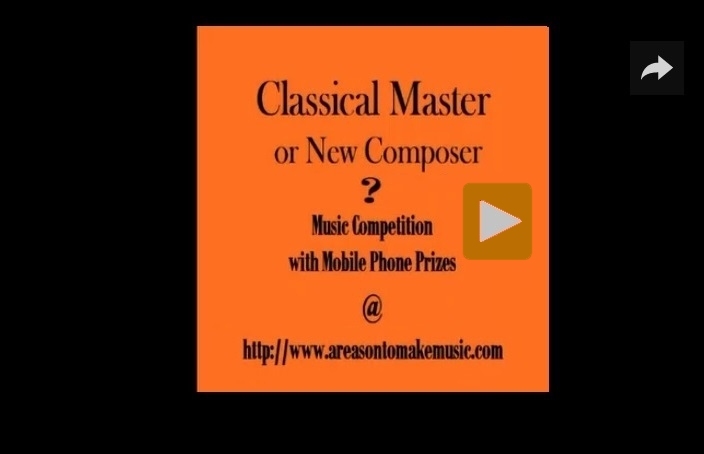 Competition Rules All you need to do for each video is submit a list (to the email address above) in the order of play, the composer and title of each composition (excluding the jingle of course). If you get all correct you have a chance of random selection at the end of May for the £10 ($16 €12) prize. 1. Under 15 years old. 2. One of the new composers being promoted. 3. A director or employee of any of Jjays associated business partners/affiliates. If you wish to have your music promoted, in public outdoor event films and/or played in to thousands in a designated shopping center this year, and distributed widely on social networks such as Google+ and Facebook, upload your mixes using the new uploader . Mostly sought is clean (no swearing) hip hop with vocals to be included in a summer radio show. A very talented photographer that has some great pictures of a floodlit London City, the Millenium Wheel and the Thames by night that would look absolutely super in a prestigious London Hotel or departure lounge at Heathrow or Gatwick Airport. The other Feedcat has out of date content and how to change it is still being sought.